Lamb burgers earlier in the week adapted from Lydia's July e-book were fab-u-lous! But...with only 2 of us eating, we had the usual leftovers. And tho I had been extremely busy and on my feet pret' near all week with shopping, prepping and co-teaching the Ethnic Spices 101 class, I wanted to do some home cooking. 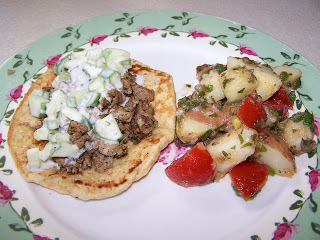 So, put together some homemade naan, crumbled up the lamb burgers and warmed them in the cast iron skillet, and threw together some tzatziki sauce. The potato salad was one I just had seen on the Food Network this morning, and I knew I had all the fixings for it. Lydia, of Divine Health, is putting together monthly e-books dedicated to cooking wholesome "real" food, that is lower carb and gluten free! I have tried several of her recipes so far and can honestly say they are real keepers! You can get July's at a discounted price right now, and she is tying up the loose ends on August's e-book, which will be available in less than 2 weeks. Lots of seasonal cooking with some extra special goodies thrown in there too. Cherry chocolate walnut bliss....YOU could be next! Mine is full of endless possibilities! Glad you have enjoyed everything so far - and YES I think the cherry chocolate walnut bliss is calling you...........you must submit to it!!! Thanks for the plug.........Peace!!! Cindy, I LOVE, LOVE, LOVE lamb and tzatziki! What a wonderful meal you have there. Thanks for sharing the recipes, too. ... my week ... unpacking, cleaning up piles, blogger luncheon tomorrow ... and THEN sit back and njoy the rest of the summer ... on the porch! the sliding cat is a hoot! Cyn, this looks amazing. My mouth is watering just looking at the picture! Good lamb is such a treat! What a great way to use leftovers. I love ideas like this. Thanks for sharing this at Two for Tuesdays blog hop! Reinventing leftovers should be a sport. Love it! Thanks for linking up at T4T. Cyn so glad you did stop by and share this on the two for tuesday recipe blog hop! I love it! Wow you can do some amazing things with leftovers!!! I am so glad you linked to Two for Tuesdays. Oh, and btw, still no crowing from my chickens. The new ones are laying though so we already got 9 eggs in 2 days - it'll be crazy if they are all ladies! Nice fill someone in on and this post helped me alot in my college assignement. Gratefulness you seeking your information.